Here I am on another wonderful Country Inn Day. I’m so glad you could join me. What do you do first thing every morning whether you’re at home or off on holiday at a gracious Country Inn or snazzy hotel? But I could use more than Erika’s spirit and soul here at the Inn today. 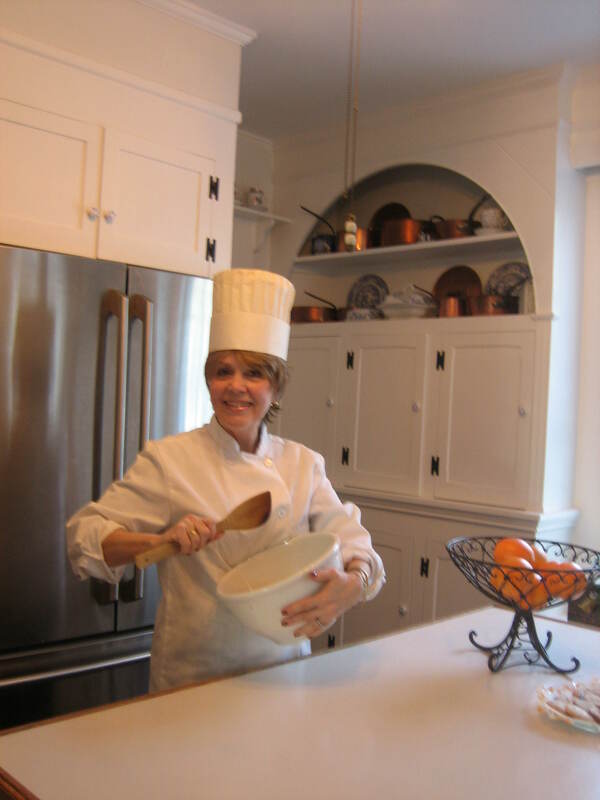 I could use her professional expertise because on this Country Inn Day I will not only be playing the part of Inn Guest, Innkeeper, and Inn Maid, but I’ll also be playing the part of Inn Chef. I’ll don my special coat and cap in preparation for a Sharing Tea. 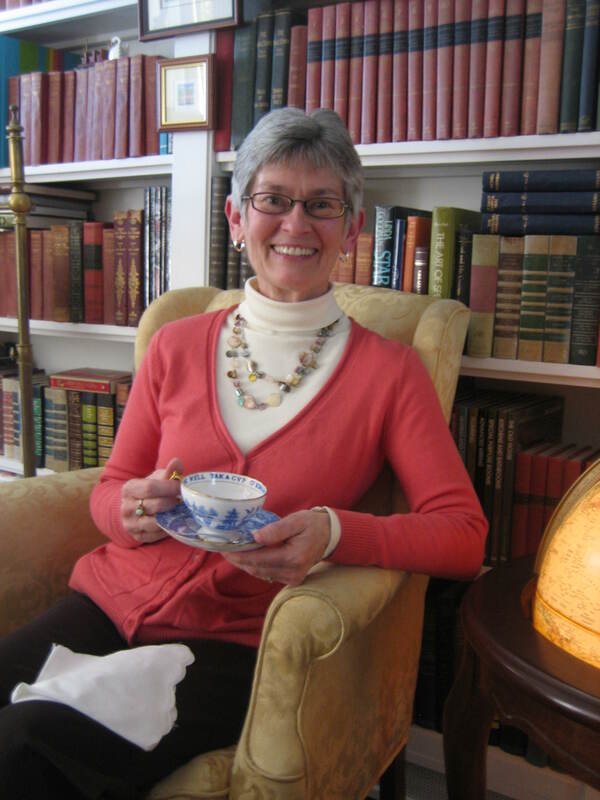 I bet if Erika were here in person she could help me whip up some extraordinary tea treats. I do have these guys to inspire me. They “hang out” (literally) in my kitchen, but though they look pretty cute they’re not a lot of actual help. 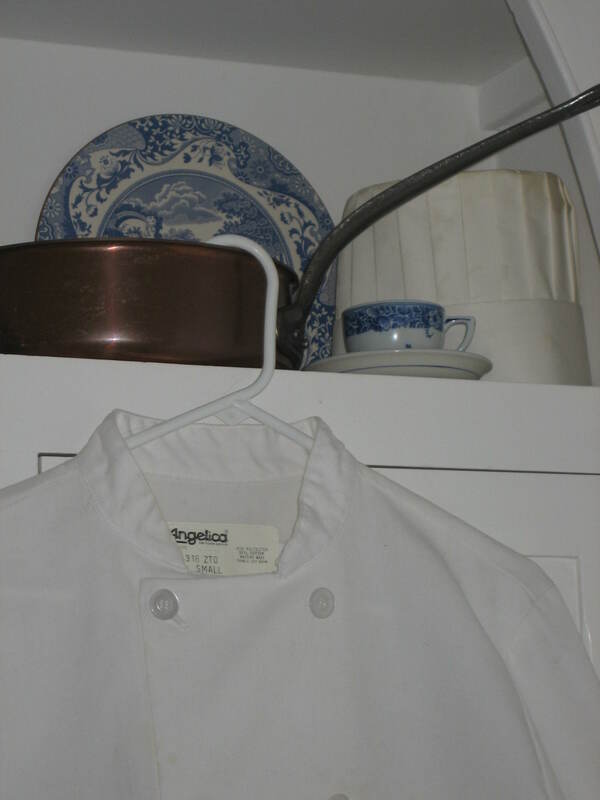 I get my help from cookbooks, and do I have cookbooks, only about a million of them. At each Sharing Tea I like to experiment just a little, so I always choose one new recipe and today that recipe comes from a little historic book. 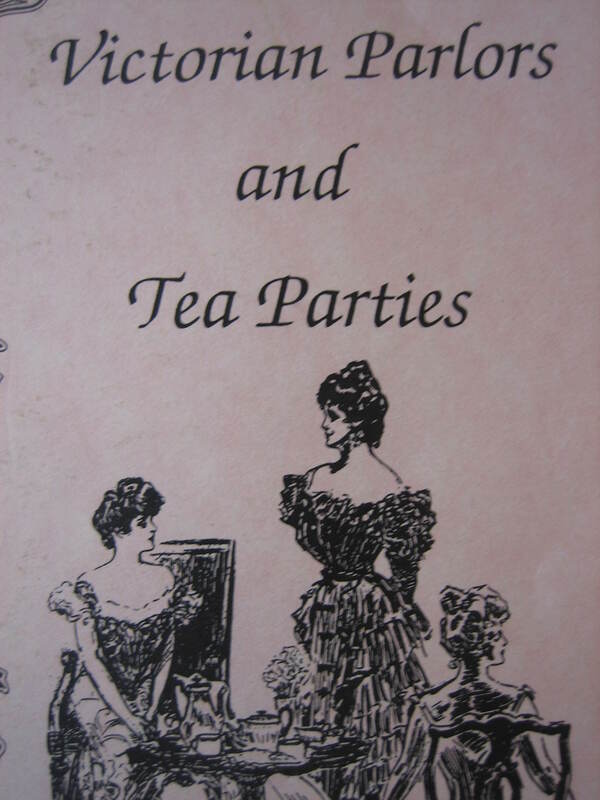 The book is called “Victorian Parlors and Tea Parties”. It’s written by Patricia B. Mitchell. 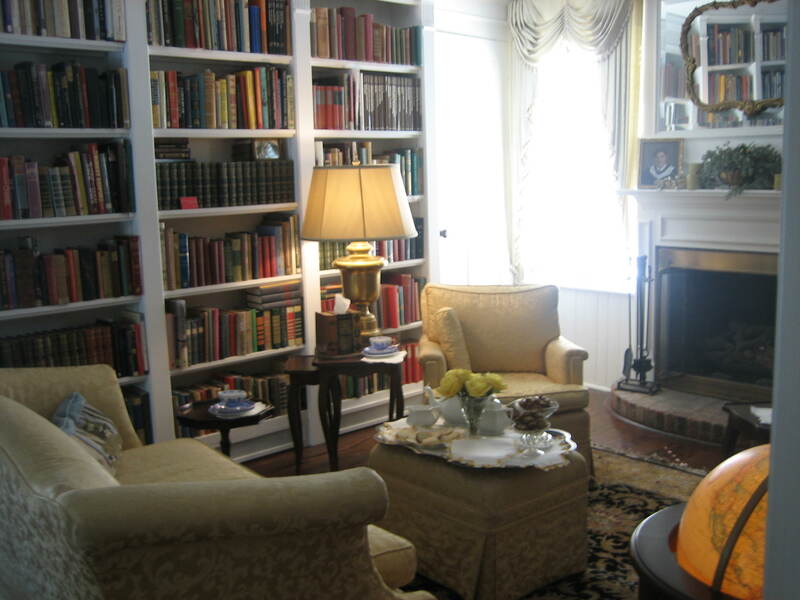 After reading and enjoying notes on the tea meal and how it came to be, along with information concerning the role of the Victorian wife and details of the Victorian parlor, I settle down to find that new recipe which I can make for and serve to today’s Inn guests. 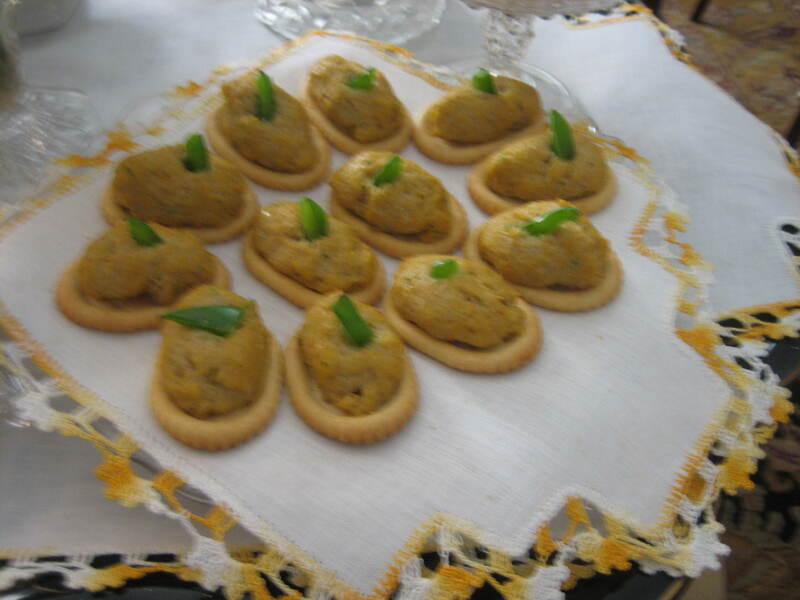 I look through all the recipes and decide on this simple crabmeat spread which is served on crackers. The little green pepper garnish is my idea. You might like to try it yourself. Here’s the recipe. It’s quick and easy. Process: Mix. Spread on toast rounds, triangles, or crackers. Heat 5-10 minutes at 400 degrees until hot and bubbly. Serve hot. 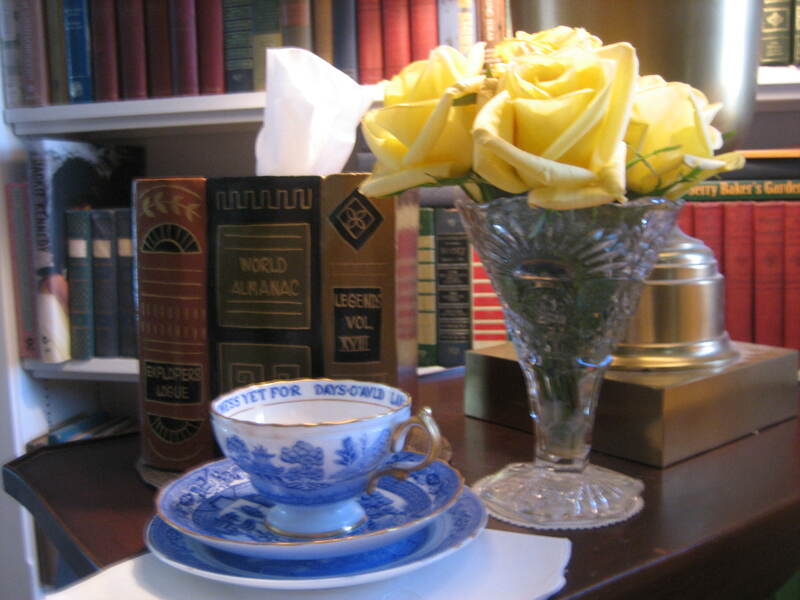 Today’s tested recipes come from a favorite little booklet called “Tea Time”. 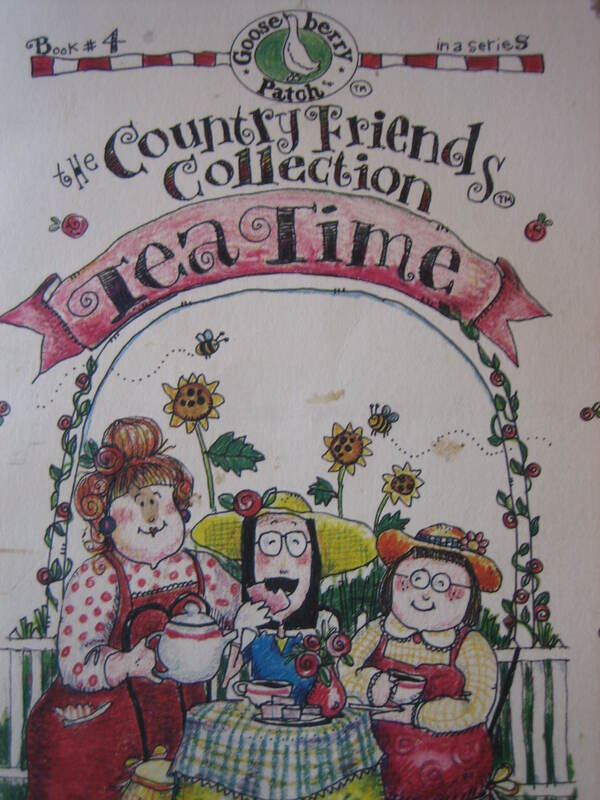 This booklet is created by the Gooseberry Patch people and I’ve discovered many tasty treats within its pages as well as amusing general information concerning the tea ceremony. 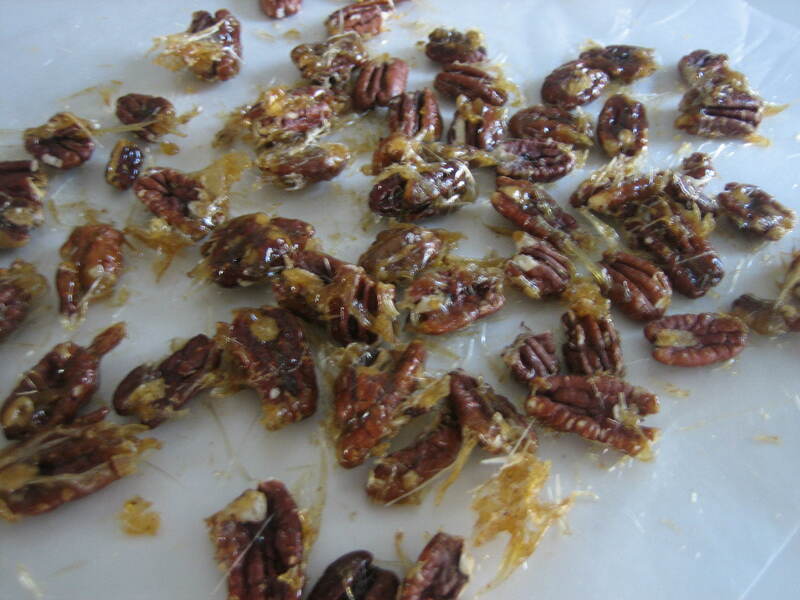 Today I make “Tea Time’s” Caramelized Pecans. 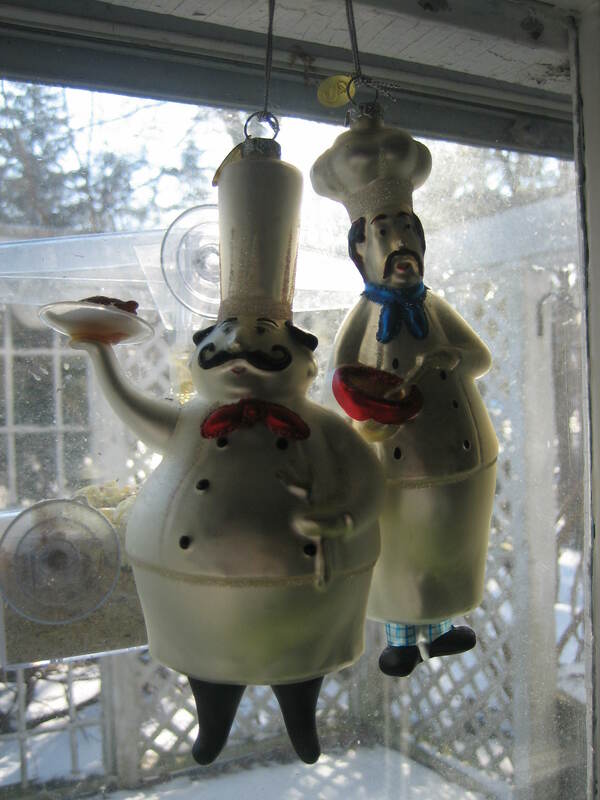 These sweet nuts are a great garnish for chicken salad puffs ( another recipe in the “Tea Time” booklet), but they can stand on their own quite nicely. Process: In a heavy saucepan, heat sugar over medium heat ’til melted (about 4 minutes.) 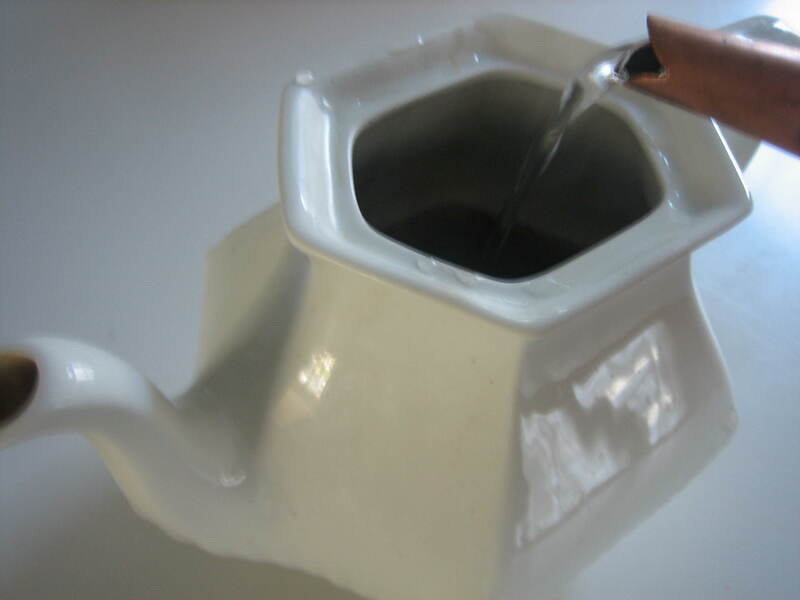 Stir constantly to avoid burning sugar. Stir in pecans until well-coated. Remove pan from heat. Pour mixture onto wax paper. Cool. If stuck together, break apart. Use whole or coarsely chop is using as a garnish. But now as Inn Chef it’s time to do some baking. 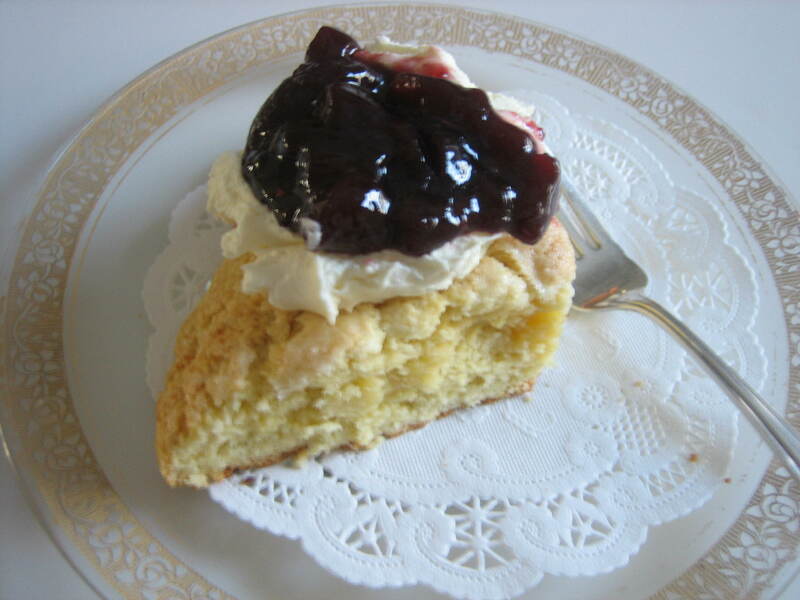 How about some Cream Scones? 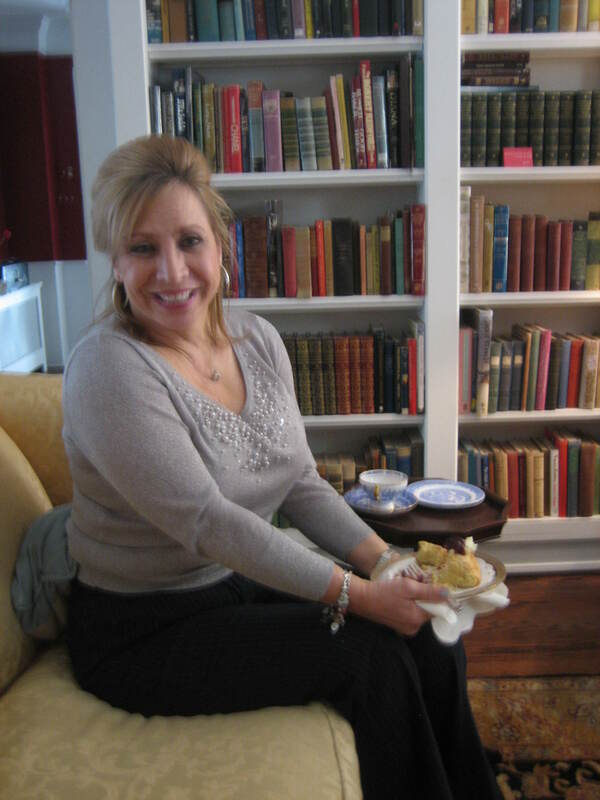 Scones are always perfect for a tea party and my “Tea Time” book has a good recipe for them. 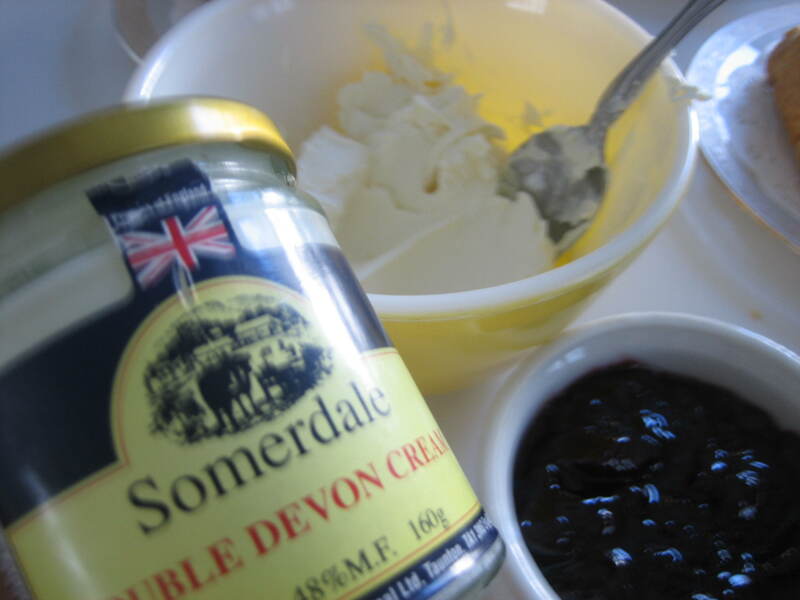 Scones are yummy, generously topped with Devon Cream (imported from England) and jam. Here’s the recipe. Process: In a mixing bowl, combine flour, baking powder, salt, and sugar. With a pastry blender or Cuisinart cut in butter until mixture resembles coarse crumbs. In a separate bowl, combine eggs and cream until well blended. Stir cream mixture into dry ingredients until they are moistened. Divide the dough into two 8-inch rounds on a greased baking sheet. Cut the dough with a sharp knife into 8 wedges. Brush the top with milk and sprinkle with sugar. Bake at 400 degrees for 10 to 15 minutes or till scones are golden brown. Rule No. 1 Thoroughly mix dry and liquid ingredients in separate bowls before combining together. Rule No. 2 Don’t over-mix when adding dry and liquid ingredients, and don’t over-handle the dough. Rule No. 3 Over-baking will result in dry scones. Oven temps may vary so check your scones every 5 minutes before baking time is up. 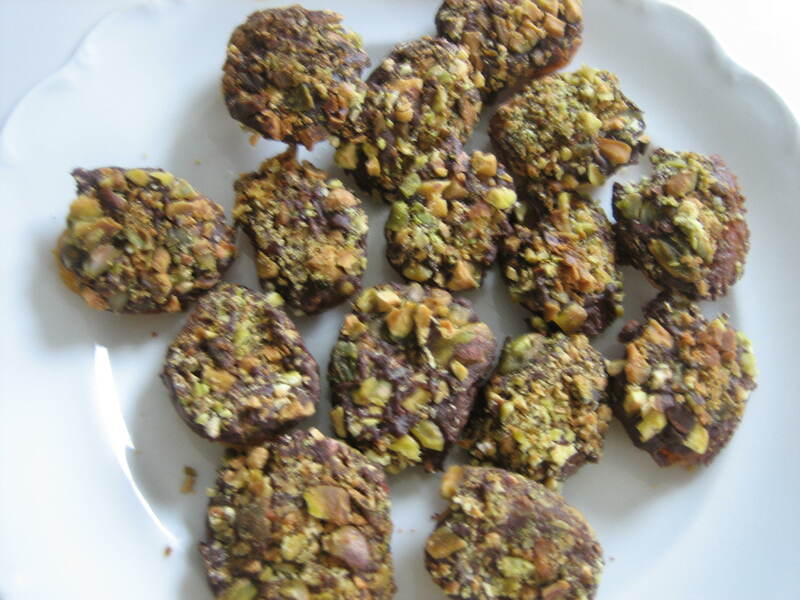 The only other tea time treat I’ll be serving today is a chocolate covered apricot which is topped with crushed pistachios. There’s nothing to this recipe. 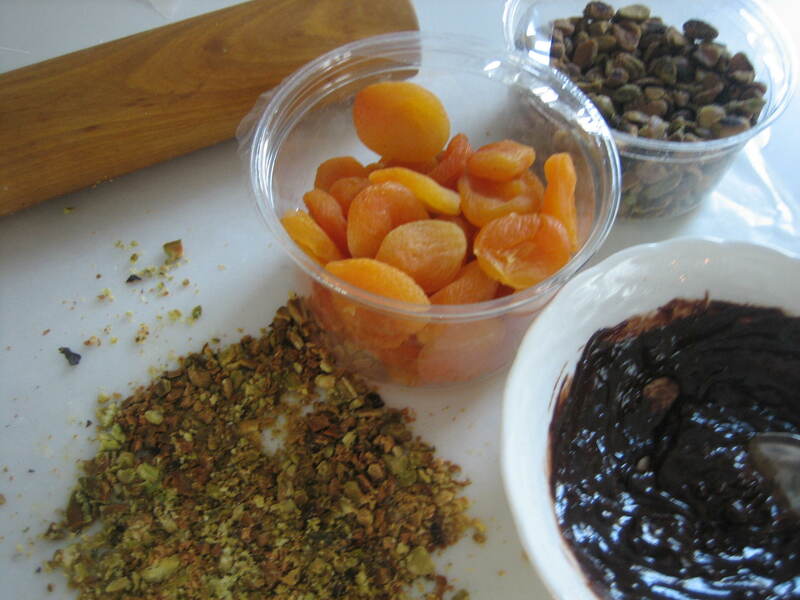 All you do is melt semisweet chocolate chips, dip the apricots into the melted chocolate and then roll them in crushed pistachios. 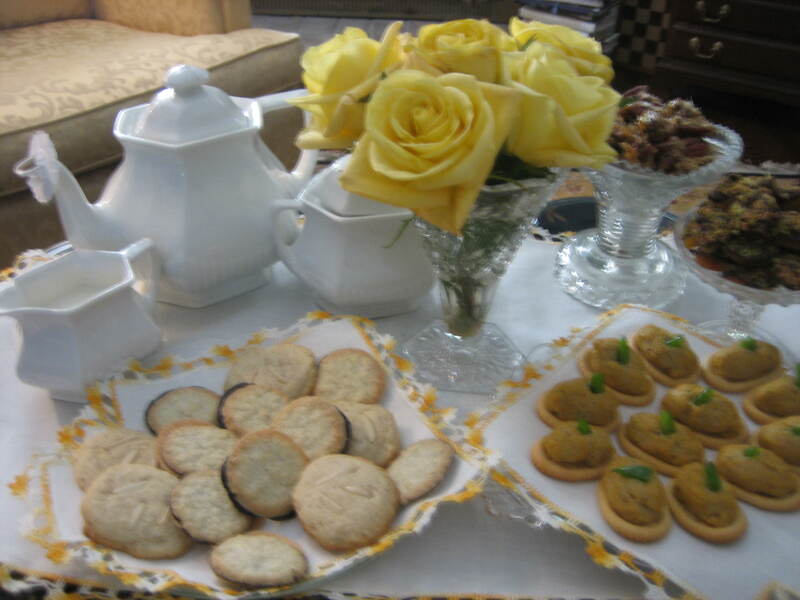 These apricot nibbles are a yummy snack anytime you crave something sweet, but they’re also a nice addition to the tea table. Today’s recipes are all simple to make and require little preparation time. Of course, if you happen to be a pastry chef you can go all out and dazzle your guests with impressive creations, but if you’re not, the idea is simply to have some little treats for your guests to enjoy. The Inn guests have arrived! 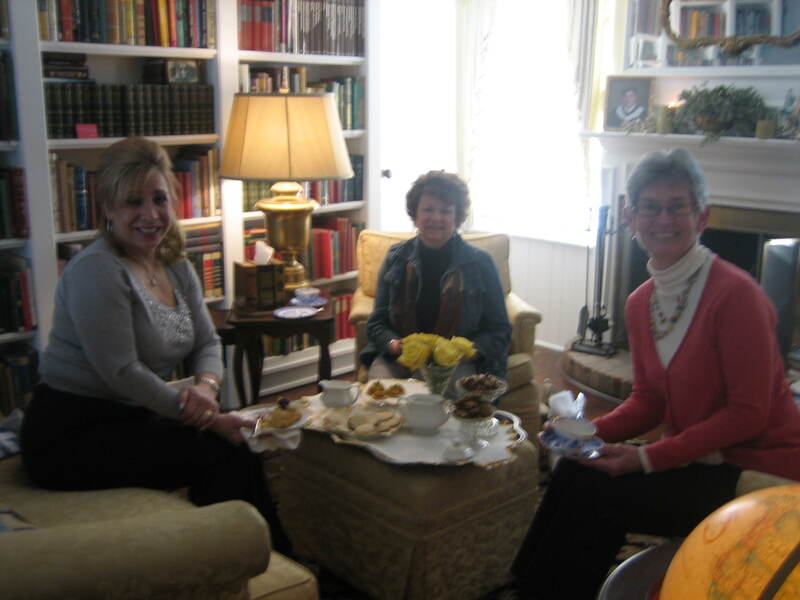 Did I tell you how a Country Inn Day Sharing Tea works? There’s always someone old invited (an old friend), someone new (a new acquaintance on the way to becoming a friend), someone borrowed maybe two (old and new invited guests may be asked to bring a friend). Joni is today’s someone old for she’s been a friend for ages. Carole is the someone new. And Carol brought Lynn along so she’s the Inn’s borrowed guest, just one today, not two. 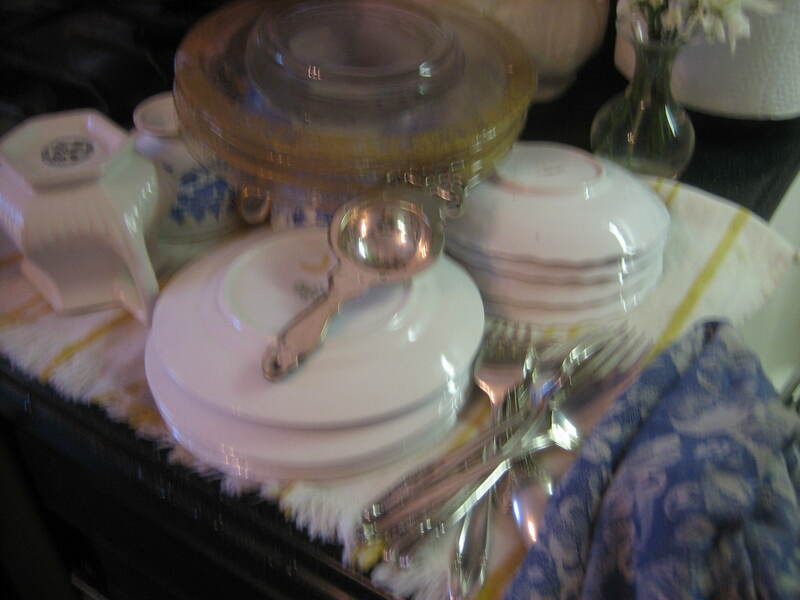 The tea is poured and this Country Inn Day Sharing Tea Party has begun. 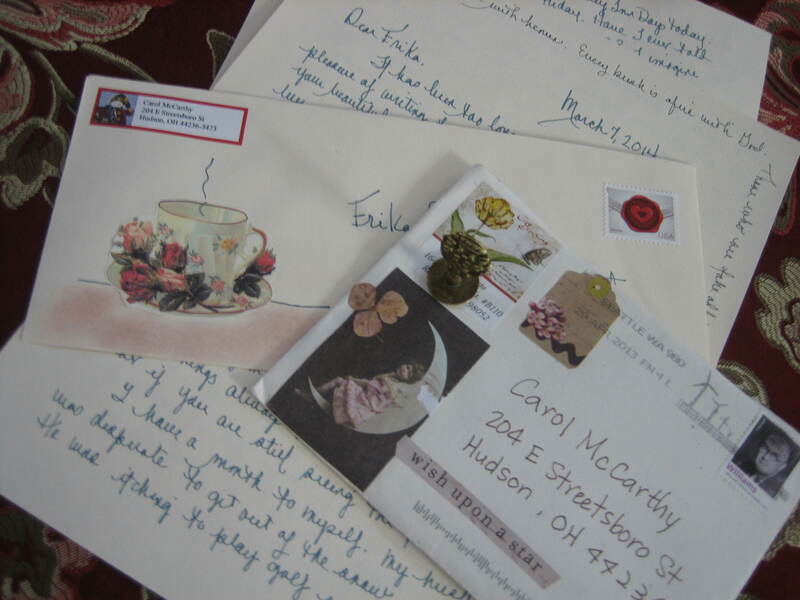 Once again I am transposed from Innkeeper now to Inn Guest. This is the magic of a Country Inn Day! I can now relax and enjoy. 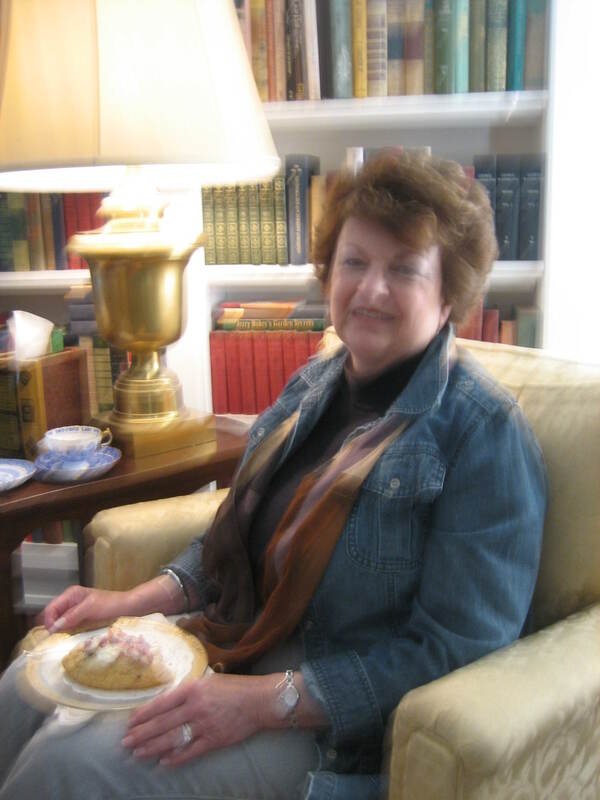 I wish you could be here with us for there’s nothing quite like taking a nice break every now and then to relax and visit with friends in a serene setting over a cup of tea. Our worlds are so full and our tasks can be very demanding. It seems to me relaxing break-times are not only nice, but a must. And when the Inn guests take their leave and the Inn Maid (me) does her magic, cleaning up the dishes, I’m left with a feeling of sweet satisfaction, for Henry James had it right when he said, “There are few hours in life more agreeable than the hour dedicated to the ceremony known as afternoon tea”, except maybe the hours of preparation leading up to afternoon tea.